Rated PG-13 for some intense peril. “Alpha” is your basic “boy and his dog” story, except this time the dog is a wolf and the story takes place twenty-thousand years ago. This is marketed as a film about the “origins of man's best friend,” but if you ask me, it’s an ad designed to guilt you into buying your kids a wolf. They’ll want one too after seeing “Alpha.” In fact, the filmmakers should have just called this movie “PUH-PEEEEEE!! !” Because judging by the audience’s oohing and aahing at my IMAX 3D screening, people were all too eager to project their own warm and fuzzy domesticated canine feelings onto a wild animal who would eat them without a second thought. But let’s play the hand we’re dealt here. The boy, Keda (Kodi Smit-McPhee) is first seen bison hunting with his tribe. He is the son of Tau (Jóhannes Haukur Jóhannesson), the “alpha” of his people. Greatness is expected of Keda, yet he’s a sensitive lad who has a problem with killing the animals. “Life is for the strong!” his father lectures after Keda fails to finish off a wounded animal. “You must earn it!” During the hunt, which is the first of many well-staged and visually arresting set pieces, Keda’s hesitation allows him to be bested by his prey; the result sends him plummeting over a steep cliff. As Keda falls, “Alpha” suddenly flashes back to a week before. We assume Keda’s fall is part of the climax, but it’s actually the catalyst that sets the story in motion. In a quiet moment during the flashback, Tau tells Keda about the alpha wolf, the animal who leads the pack and to whom the other wolves defer. We also learn some of the tribe’s rituals that will become important pieces of shorthand later. Director Albert Hughes and his editor Sandra Granovsky employ a nice flurry of quick cuts from the opening hunting sequence to bring us back to Keda’s seemingly fatal plunge. The cliffside ledge where Keda lands is too far for Tau to reach, so he has no choice but to mourn his son and move on. Indeed, Keda’s situation seems hopeless—an attempt to climb in either direction means almost certain death—but screenwriter Daniele Sebastian Wiedenhaupt finds a way out that’s both gleefully unpredictable and absolutely preposterous. There are more scenes like this in “Alpha,” moments where faith and suspension of disbelief are the only things that will carry you through, but the pacing is swift enough to ward off too much contemplation before the next danger befalls our heroes. Keda’s inability to kill works out well for the wolf in this story. While splinting the gruesome injury that resulted from his cliff adventure, Keda is hunted by wolves who find wounded prey especially tasty. The alpha wolf of the pack is left for dead after Keda injures it, and rather than act out of vengeance, he decides to nurse the wolf back to health. He names it Alpha. Slowly, the duo start to trust one another. Keda becomes more like an alpha wolf, and Alpha turns into a lupine Rin-Tin-Tin. There’s a pleasant, old-fashioned feel to “Alpha.” It plays like one of those Disneynature movies with sharper edges, a bit more grime and a complete lack of the English language. That’s right, Sony is hiding from you that this film is subtitled, which is not only shifty but insulting to subtitles. The language Keda and his tribe speaks is interesting in that it occasionally doesn’t seem to match the translation. At one point, a character sounds truly impassioned and inspired, speaking for a long time. The result is three subtitled words. Still, credit is due to the filmmakers for staying true to a time before English would have been spoken. The best feature of “Alpha” is its imagery, which is absolutely stunning in IMAX. Hughes, his cinematographer Martin Gschlacht and the visual effects team create a world that is as beautiful as it is dangerous, often framing the characters in the center of a vast, almost endless landscape. The water here is preternaturally blue, the sky is chock full of stars and the ground is unforgiving whether covered in desert sand or brutal ice. The film’s most intense scene shows Keda trapped under a frozen lake, swimming furiously while Alpha tracks him from above. There’s a majesty to the images in this sequence that is breathtaking. This could play at museums forever once it leaves general release. Smit-McPhee gives a good performance here, showing the evolution of his character without much dialogue. He has a genuine rapport with whatever it is playing Alpha. (Is the wolf live, or is it Memorex, I mean CGI?) 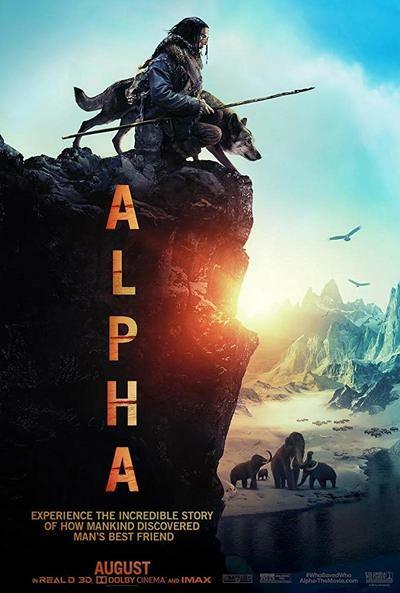 Kids over eight will get a kick out of this one, and so will their parents, because “Alpha” is a credible adventure movie with a slightly gooey undercurrent of sentiment. It will play better for dog lovers than cat people. This is the story of a beta boy who learns to be an alpha wolf, and an alpha wolf who becomes his subservient pet. It’s a charming story, to be sure. Unless you’re a wolf.